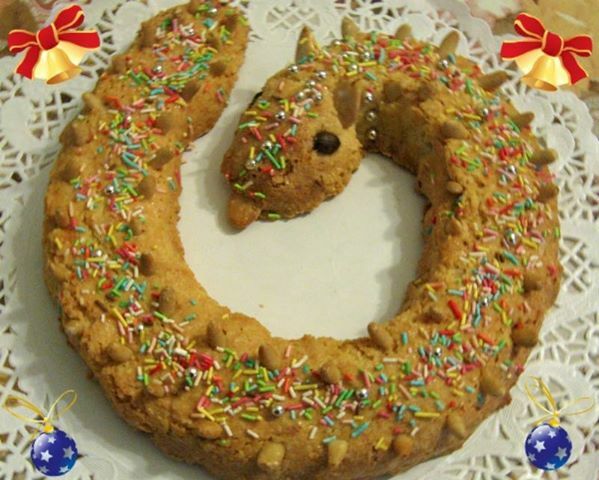 The torciglione umbra is a pastry which comes from the pagan world. The Umbrian snake Umbrian symbolises the nature’s ability to regenerate. Its twisted shape recalls the year’s cycles which ends and starts again. Ancient people in the Trasimeno area, during the winter solstice, had the habit of doing a similar sweet bread with pine nuts and honey. The pastry was created during the visit of high prelates who arrived on Friday, after several days of freezing weather. Lacking of seafood, the nun came up with a recipe which represented a eel using available ingredients. The symbolic value of the cake is today represented by the presence of pine nuts or almonds on the top, and two cherries on the tip. Ingredients: Lb Ground almonds, 4 tablespoons of ground bitter almonds, 20 tablespoons of sugar, 2 tablespoons of Brandy, 1/3 cup flour, 3 egg whites, 1 egg yolk, whole almonds and 2 Coffee beans for decoration. Directions: Beat the egg whites. Quickly mix the ground almonds with the sugar, the brandy, the egg whites and the flour to obtain a rather firm dough. Roll the dough by hand to form a stick about 1 1/2″ thick. Shape one end in the form of a pointed snake tail and the other end in the form the head. Beat the egg yolk and brush it over the entire body of the snake. Place the whole almonds with the peel over the entire body to simulate scales. Place the two coffee beans on the head to simulate the eyes and an almond in the mouth to simulate the tongue.